fan out from the seat. A set of these along with the "Comb Back" Windsor arm chair are perfect around the family dining table. People never seem to tire of these chairs. 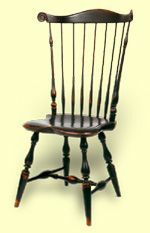 It remains one of the most enduring Windsor chair styles. Made from maple, poplar and hickory, it is available in a paint or natural wood finish, and in an aged and distressed paint finish.